Foliage: Bright green, alternate leaves, elliptic to oblong or oblong-obovate; abruptly acuminateor acute, rarely obtuse, 3-8 cm. long. Leaves may appear whorled at the branch tips. Flower: 5 lobed, pink to white, not always fragrant. ; corolla is funnelform; in clusters of a dozen or so; glabrous floral bud scales, 1 - 1.5" long. Flowering time: Flowers early to late May, appearing before or with the leaves. Fruit is a brown dehiscent capsule, early July to late July. Range in New Jersey: woodlands of Northern and Middle districts, occasional in Cape May peninsula, and very rare in the Pine Barrens. Misc. 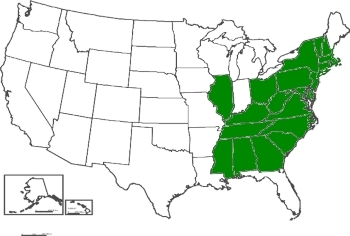 USDA lists as facultative wetland species; i.e., Equally likely to occur in wetlands or non-wetlands (estimated probability 34%-66%). 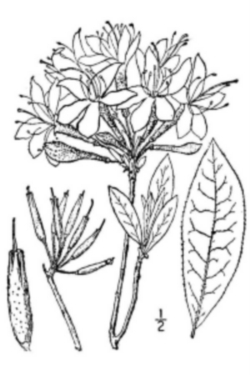 Stone (1911) notes "While frequent in the woods of West Jersey, this Azalea is by no means typical of the coastal plain, (Rhododendron viscosum) being the characteristic species of the region. 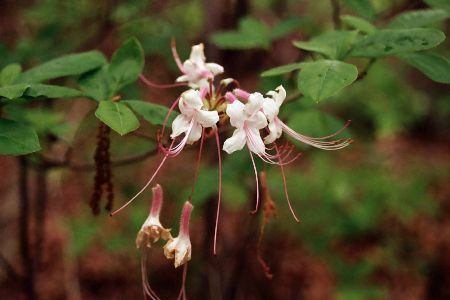 periclymenoides=resembling a species of honeysuckle.